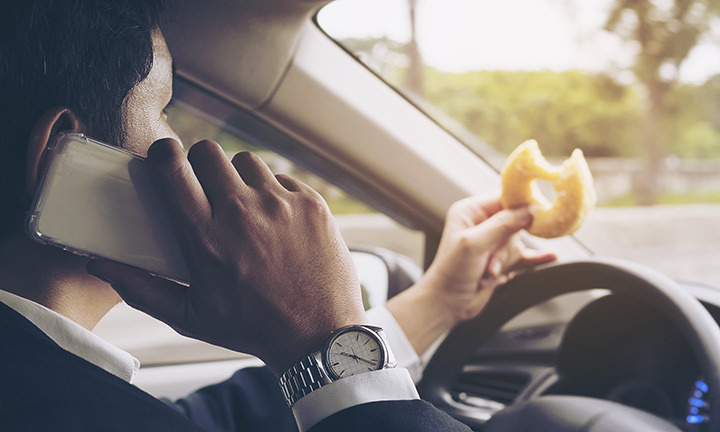 Motorists have so many distractions vying for their attention – from cell phones and dashboard systems to fast food and screaming children. One moment of distracted driving can change a life forever. Last year, more than 40,000 people were killed in motor vehicle fatalities. We urge motorists to avoid distractions and focus on driving. Everything else can wait. Distractions lead to driver error. The National Safety Council reports that 94% of crashes are caused by driver error, meaning almost all crashes are preventable! Distracted driving doesn’t just affect you. Drivers talking on phones, whether hand-held or hands-free, miss seeing up to 50% of what is going on around them, including other drivers, pedestrians and bicyclists. A “quick” text or call can mean missing seeing the first responder pulled over on the side of the road or a child darting into the street. According to the AAA Foundation, drivers can be distracted for as long as 27 seconds after using voice-based technology to dial, change music or send a text message. At a speed of just 25 mph, a motorist can travel the length of three football fields during this amount of time. Imagine what that means when you are traveling 70+ mph on the highway! Driving requires your full attention. Just because you’ve driven a route plenty of times or have become accustomed to scrolling your favorite social media while switching lanes, doesn’t mean you have somehow mastered distracted driving. Evaluate your driving habits and take action to make your next trip safer. Don’t compose, send or read text messages or emails while driving. Stay off Facebook, Snapchat, Instagram, Twitter and other social media apps. Ask a passenger for help with placing a call, navigating directions or adjusting dashboard controls. Secure loose items. They can quickly become distractions or projectiles in a sudden stop or vehicle accident. Avoid multi-tasking in the car. Pull over to care for children. Stop to eat or drink. Don’t drive when fatigued or under the influence of alcohol, medications or other drugs. Allow extra time for your trip to account for any additional stops and to avoid the need to rush to your destination. At some point, you may be involved in an accident or witness one. Your role could range from calling 911 to redirecting traffic to performing lifesaving skills. Formal CPR, AED and First Aid training will provide the necessary skills and practice to respond confidently in an emergency. Click here to find an Instructor or CPR class near you. It’s also important to be prepared to respond by stocking your vehicle with a First Aid Kit. At minimum, we recommend always carrying gloves and a CPR barrier. Throw them into your glovebox or grab a convenient Keychain CPR Barrier that way they are always with you no matter where you go. Your safety is of the upmost importance when responding to an emergency. A few minutes of preparation can make a real difference later down the road.